Interstate 440 follows the East Belt Freeway from I-30/530 to I-40 around Little Rock and North Little Rock. The freeway loop provides a truck route for hazardous materials and connects with the passenger terminal at Bill and Hillary Clinton National Airport (LIT). Highway 440 extends from I-40/440 along the Northbelt Freeway to U.S. 67/167 (Future Interstate 57). The rural freeway traverses Ink Bayou and other wetlands into the city of Jacksonville. The Northbelt Freeway was completed by February 2003. 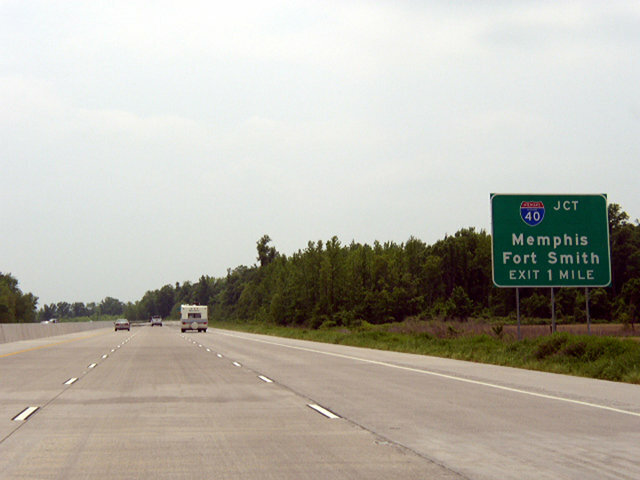 It remains signed as a state highway, because it does not connect with an Interstate highway at each end.2 This will change once I-57 is fully signed along the U.S. 67/167 freeway leading northeast from North Little Rock and Jacksonville to Walnut Ridge. 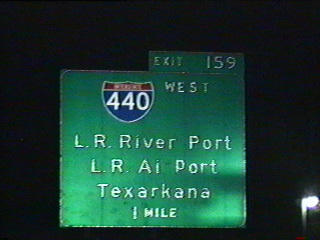 Button copy guide signs for I-440 on I-40 referenced Little Rock Airport and River Port in addition to Texarkana. Image captured from May 30, 1995 video. 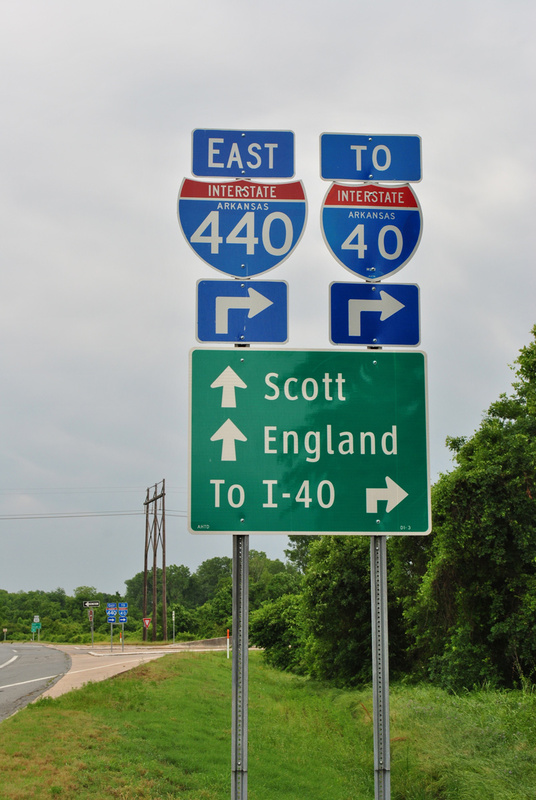 Interstate 440 proceeds north from a folded diamond interchange (Exit 10) with U.S. 70 to the exchange with I-40 and Highway 440 (Northbelt Freeway). Photo taken 05/07/12. Spanning the Arkansas Midland Railroad, two lanes part ways at the north end of Interstate 440 for I-40. 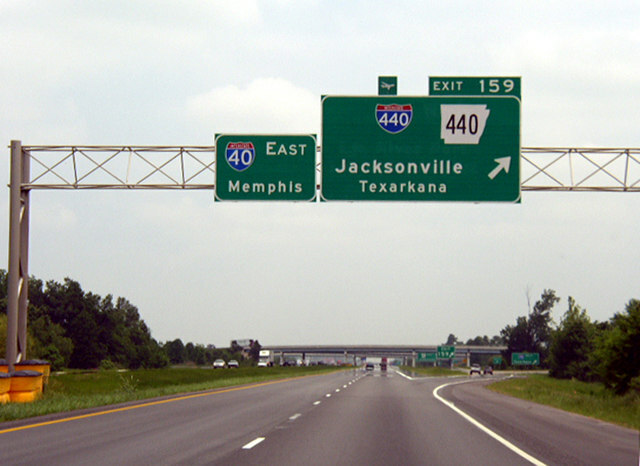 Arkansas 440 extends the freeway north five miles to U.S. 67/167 in Jacksonville. Photo taken 05/07/12. Exit 11 separates for Interstate 40 west across North Little Rock and the rural drive 118 miles east to I-55 at West Memphis. Photo taken 05/07/12. 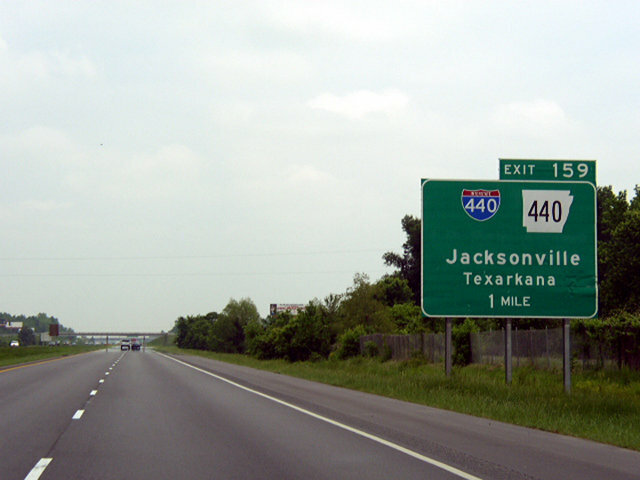 Highway 440 advances one mile south from Ink Bayou to the cloverstack interchange (Exit 11) with Interstate 40. Photo taken 05/20/14. 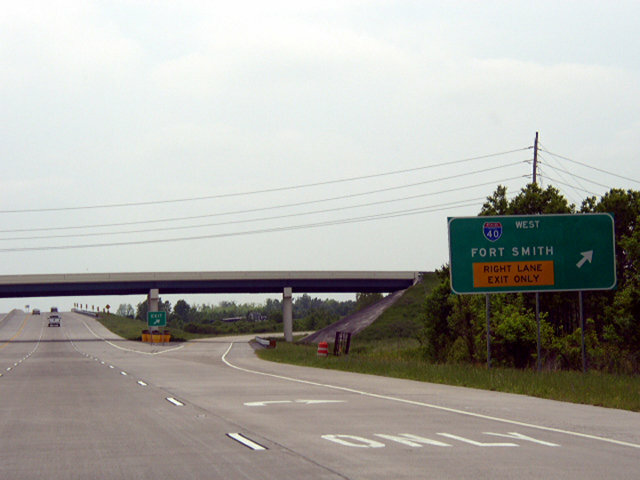 A lane drop occurs at Exit 11 for Interstate 40 west across Little Rock toward Fort Smith. Photo taken 05/20/14. Eanes Road spans Arkansas 440 southbound at Exit 11. 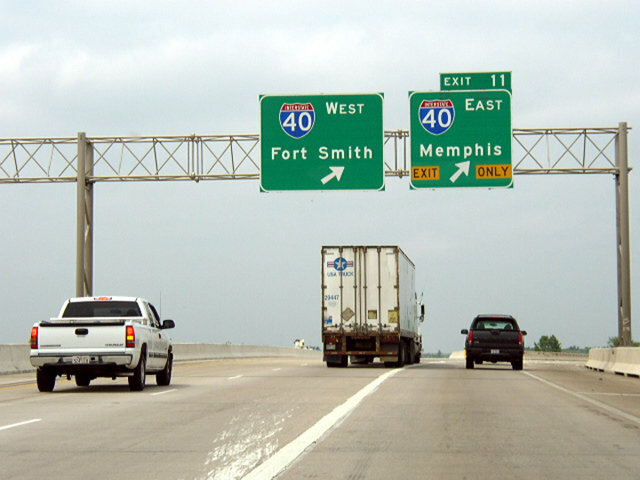 A loop ramp (Exit 11B) follows for Interstate 40 east to West Memphis and Memphis, Tennessee. Photo taken 05/20/14. 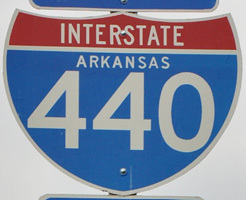 Interstate 440 commences south from I-40 to U.S. 70 in North Little Rock and across David D. Terry Lake (Arkansas River) into the capital city. Photo taken 05/20/14. 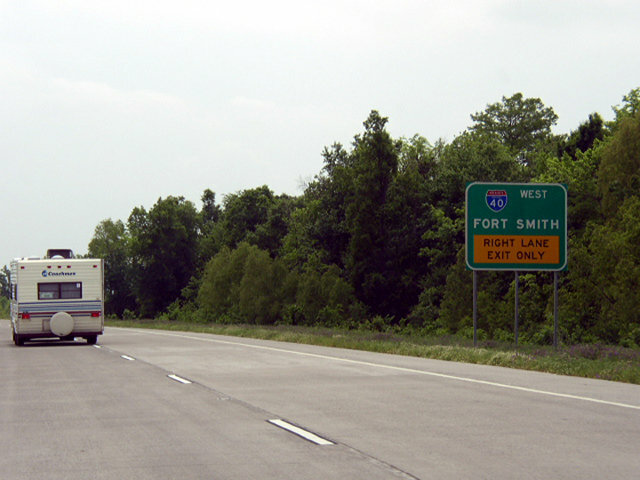 An array of truck stops and service centers line the I-40 frontage roads leading west to the cloverstack interchange (Exit 159) with Interstte 440 west and Arkansas 440 north. Photo taken by Chris Patriarca (05/03/03). Exit 159 partitions from Interstate 40 westbound by Harris Lake for both I-440 west to LIT Airport and Highway 440 (Northbelt Freeway) to Jacksonville. Photo taken by Chris Patriarca (05/03/03). Interstate 440 arcs southwest across the Arkansas River to connect with I-30 south of Downtown and I-530 north of Sweet Home. Highway 440 continues the belt route north to Future I-57 at Jacksonville. Photo taken by Chris Patriarca (05/03/03). Interstate 40 crosses wetlands south of Stark Bend on the rural approach to Exit 159 with I-440 west and Highway 440 north. Photo taken 05/07/12. 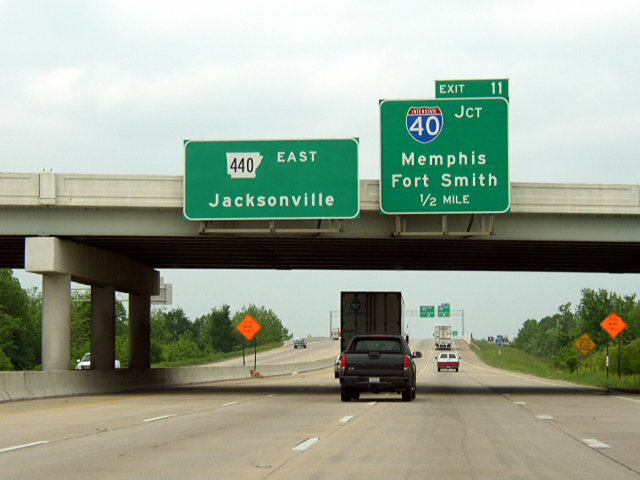 A collector distributor roadway partitions from Interstate 40 east for I-440 west to Bill and Hillary Clinton National Airport (LIT) and Highway 440 north to Jacksonville. Photo taken 05/07/12. The westbound ramp for Interstate 440 to the Little Rock River Port and I-30 west to Texarkana departs from the c/d roadway at Exit 159. Photo taken 05/07/12. May 3, 2003 photos from Chris Patriarca showing replaced guide signs for the exchange joining I-40 with I-440 and Highway 440 in North Little Rock. Westbound Interstate 440 elevates along a 2.3 mile long viaduct from College Station to the systems interchange (Exit 138) with I-30, I-530 and U.S. 65/167. Photo taken 05/20/14. Interstate 440 westbound partitions into ramps for I-30 east to Downtown Little Rock and I-530 & U.S. 65/167 south to Pine Bluff. The mainline defaults onto Interstate 30 westbound toward Benton and Hot Springs. Photo taken 05/20/14. Interstate 30 arcs northeast around the periphery of Granite Mountain to Exit 138 with I-440 (East Belt Freeway) and I-530 & U.S. 65/167 south. Photo taken 05/07/12. Crossing Fourche Creek and a Union Pacific Railroad along a 0.4 mile viaduct, Interstate 30 east reaches the split with Exit 138A for Interstate 440 to LIT Airport. 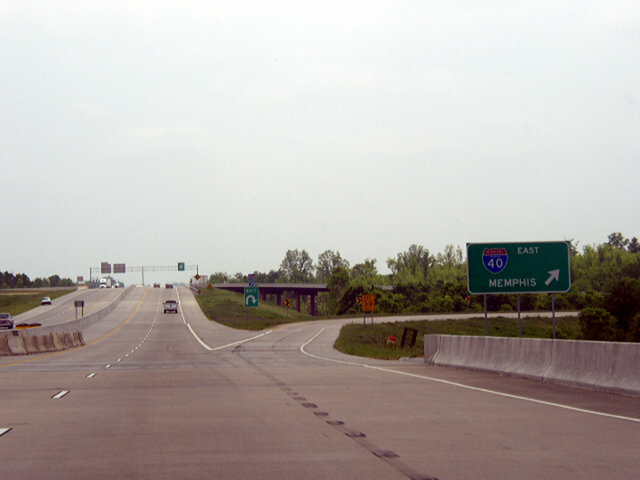 The ensuing ramp connects with I-530 south to Sweet Home and Pine Bluff. Photo taken 05/07/12. One mile south of Exit 1A for Interstate 440 east and Exit 1B for I-30 west on I-530 & U.S. 65-167 north between Echo Valley and Gillam Park. Photo taken by Chris Patriarca (05/03/03). A systems interchange (Exit 1) with three left side ramps connects Interstates 30, 440 and 530 amid wetlands along Fourche Creek. Photo taken 05/20/14. Exit 1A leaves I-530 & U.S. 65-167 north for Interstate 440 east to Bill and Hillary Clinton National Airport (LIT) and the College Station community. Photo taken 05/20/14. Leading 10.1 miles east from I-530, Interstate 440 allows travelers to bypass Downtown Little Rock en route to Memphis, Tennessee. Photo taken 05/20/14. Left Exit 138 connects with I-440 east beyond the Interstate 530 separation from I-30 west. Photo taken 05/07/12. The flyover at Exit 138 spans Fourche Creek ahead of the I-440 viaduct extending east to Highway 365 and Frazer Pike at College Park. Photo taken 05/07/12. “Notice to Media.” Arkansas State Highway and Transportation Department (AHTD), September 25, 2003. Arkansas 440 information courtesy Matt Hollis.